It is true when they say that when you buy a laptop you can't stop accesorizing! It is true! I got the first accessory for my laptop and it was a practical/functional one: A chill pad (laptop cooler) to keep it from overheating. I did not do any online research on them, I just went to a local computer shop, looked at all their options, and picked up the one with the lowest price that looked like it wouldn't break right away! 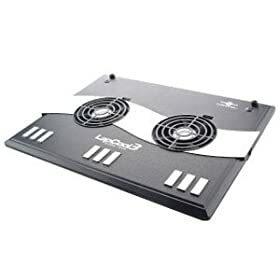 Not exactly a PC Magazine test :) I ended up getting the Vantec LapCool3 USB Notebook Cooling Pad, which is also available at Amazon, and it has 49 user reviews. So today I did the cooler experiment: I ran the notebook using the battery (not connected to the AC power supply) while running the USB-powered laptop cooler fan underneath the computer. I did a combination of configuring and changing computer settings (eg Control Panel) and then web-browsing (3-4 browser windows in parallel). In 90 minutes I used up 2/3rds of the battery. So that would be about 2 hours and 15 minutes if I continued all the way. I have not uninstalled any of the trialware/hogware yet, I am running Aero (still find it cool), I did not change the default LCD settings, and I am using the default HP power management plan. I also used this laptop cooler (aka chill pad) to cool off my cable box, powering it from the cable box's USB port. In about an hour it managed to cool it off as well. Again, it did not go from Sahara to North Pole, but you could feel the difference by touching it. Before connecting to the net I went through the security programs. Microsoft's own Firewall is included with the system, along with Norton's Internet Security software. The Norton software includes 60-days of free updates. The 60-day count starts only when you activate the Norton Security software, not the day you turn on your computer. The Norton software should continue to work past the 60 days, but it won't be receiving any new updates. As common sense and the Microsoft software suggest, you should only run one of these two firewalls at any instance, otherwise they'll get in each other's way. I also turned off automatic Norton LiveUpdates because if I didn't, it would take over the internet connection and the computer trying to download all the billion updates it missed while the computer was sitting at a warehouse waiting to be purchased :) The only reason I did this was so that I could start surfing the net right away. It is of course a good idea to get the latest updates for the security software you are planning to use (eg virus definitions, security updates, spyware updates). Especially if you are going to be entering usernames and passwords. By the way, both the McAfee and the Computer Associates security suites are free after rebates this week at Staples. Or you can get some of the more lightweight and efficient software by the lesser known security software companies. Then I proceeded to test the state of the art dial-up connection :) Vista has an Easy Internet Sign-up feature but it only works if you have one of the three major ISPs (AOL, Earthlink, and another one I forgot). Otherwise, you have to do it manually, which is actually very easy: You go to the Control Panel, then Network and create a new dial-up connection using your user name, password and the ISP's phone number. That's all you need to enter, nothing else. Windows does its magic behind the scenes and voila you are connected. Internet Exploder is included and installed so you can start surfing right away. Needless to say I will be downloading Firefox and friends for most of my browsing. I'm not a big fan of IE. Speaking of IE, a Yahoo Search toolbar (among many other unnecessary things) was embedded in it. One thing that is a bit disappointing is that the internet connection icon (bottom right corner of the screen) is not flashing to indicate activity like it used to with previous versions of Windows. That flashing was a good way to both monitor what's happening to your connection and how busy it is. I'll try to find out if that can be done or if there's a utility that can do the same thing! And a quick note on the wireless. If you are not familiar with wireless, there is a button on the front-left of the computer that you can use to manually turn off any wireless activity. When it is turned off, the light is Orange. But if you are planning to use wireless or just check to see what's in the area, you just slide the switch to the right and the light turns Blue. When scanning for networks in the area, you get a list of them, with signal strength, network name, and whether they are secured (all but one were secured). But again, if you are worried about wireless security and stuff, just slide the button to the left (Orange light)! This week Staples has free after rebates Computer Associates AntiVirus 2007 and Internet Security Suite. Also a couple of the McAfee suites are free after mail-in rebate. And you can get Norton free as well if you use the "buy with new computer" rebates and competitive upgrade rebates. All the rebate details can be found in the gigantic thread on this computer deal at FatWallet.com The "buy with new computer" rebates are usually valid if you buy the software within 14 days of the purchase of a new computer, they don't have to be on the same receipt. As always, do read the fineprint, and such before purchasing. WiFi Scanning: I keep playing with it, and I've come to the conclusion that the switch for the WiFi radio is not and on/off switch, but a toggle, similar to the switch for the touch pad. By default, the wireless comes up 'blue', regardless of the switch position; sliding the switch to the other position causes it to change to 'red'. I'll have to test the behavior when coming out of sleep and hibernation; my minimal testing was across boot cycles when reinstalling the OS. Yes, I haven't tested what it is actually doing, I was only going by the color lights. You are right it is blue when you boot up, I forgot what it is after hibernation, i'll try to remember to check it out next time I hibernate! I got the Belkin Cooler. Though more expensive than some, I liked how the single fan lined up with the vent on the bottom of my Compaq F730 notebook. btw - I recently got a Gadget (freebee) that shows the graphics card function, temperature & performance. thanks for the update! nice to hear from you again! mine is still alive and kicking as well, despite years of sometimes heavy use. I'll check out that Gagdet - that sounds like a handy tool!